I do love good food! British food is probably not the first cuisine you would choose when deciding what to eat, especially with dishes like mushy peas. England is not really known for its food. But after spending more time in England, there are a few British foods that I think we could use more of here on this side of the pond. I think, in general, traditional British food is simpler and heavier than American food. It reminds me of American comfort food with interesting ingredients and sauces. The British love their sausages, pies, and fried foods like fish and chips. They also love their curry and some now say it is the British National Dish. I have also found that the British have more different types of desserts than we do in the US. There is a lot more to British food than I expected, as I keep learning about new dishes all the time. You might also enjoy reading more about other European delicacies. First of all, let me just say that clotted cream is not the same as butter. If you have never tried it, you really should! Clotted cream is made by indirectly heating full-cream cow’s milk using steam or a water bath and then leaving it in shallow pans to cool slowly. Unfortunately, it has a very short shelf life so virtually none is exported. I have seen some clotted cream in the US and even found some British foods online on Amazon (pictured below). It is not the same as what you get in England (The clotted cream I got from Amazon is pasteurized). You will need to whip it before serving and it will separate (you can just pour off the liquid). Clotted Cream is as essential to an English afternoon tea as proper etiquette. It is most commonly used as a spread on a scone like we might spread butter on a biscuit and then topped with jam. The texture and flavor of clotted cream is creamier and sweeter than butter. I could just eat it by itself, it tastes that good. I also found clotted cream ice cream at Tesco’s in England, which I had to try and it was really good too. 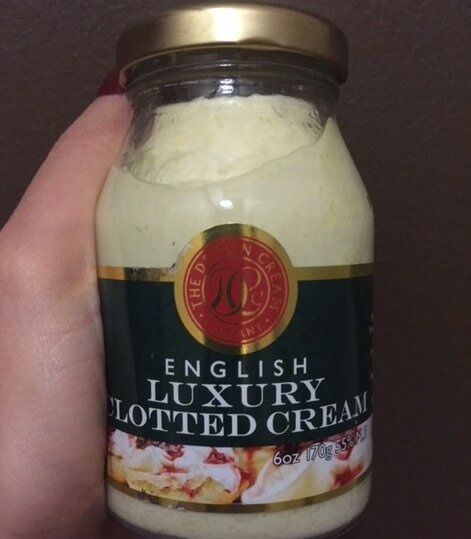 Clotted Cream purchased on Amazon. Savory pies are a quintessential British Food. A fish pie is sort of like shepherd’s pie but with fish instead of beef. A mixture of different kinds of fish are poached (or baked) and then combined with a cheese sauce and vegetables. Then you top the mixture with mashed potatoes and little more cheese and bake in the oven. Traditionally it also has a hard-boiled egg in it, but I requested that mine didn’t. Russell, my boyfriend, made it for me for New Year’s Eve and it was really good. It is not easy to make but definitely worth the effort. Don’t ask what is in black pudding, or you will never want to eat it. It is not pudding like we would think of in the US, the British use the term much more broadly. I was scared to try it until my boyfriend made it for me, and now it is one of my favorite things. 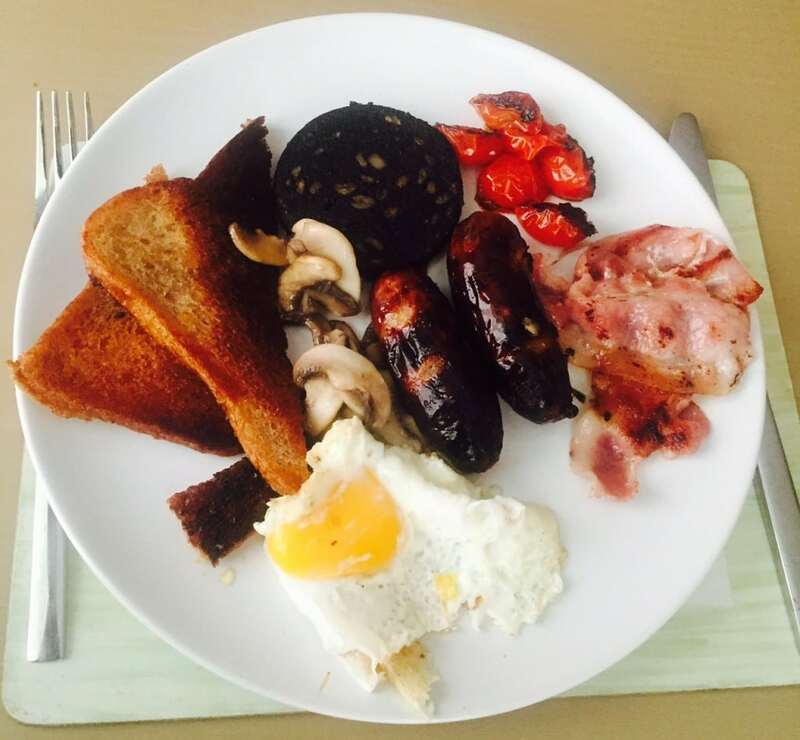 Black Pudding is served as part of a full English Breakfast along with eggs, toast, sausage, bacon (well Canadian bacon), tomatoes and mushrooms. Baked beans are also part of a full English breakfast, but we usually leave that out. English Breakfast made by Russell. Black Pudding is key. We intentionally left out beans because to me that’s not a breakfast food. The best way I can describe this is that it is kind of like what we would call a turnover. It is a hollow muffin. Yorkshire pudding is traditionally served with roast beef, but it is also served at Christmas dinner or with any roast dinner. I tried it for the first time at the Dabbling Duck Pub in Norfolk, and it was delicious, especially when dipped in gravy. 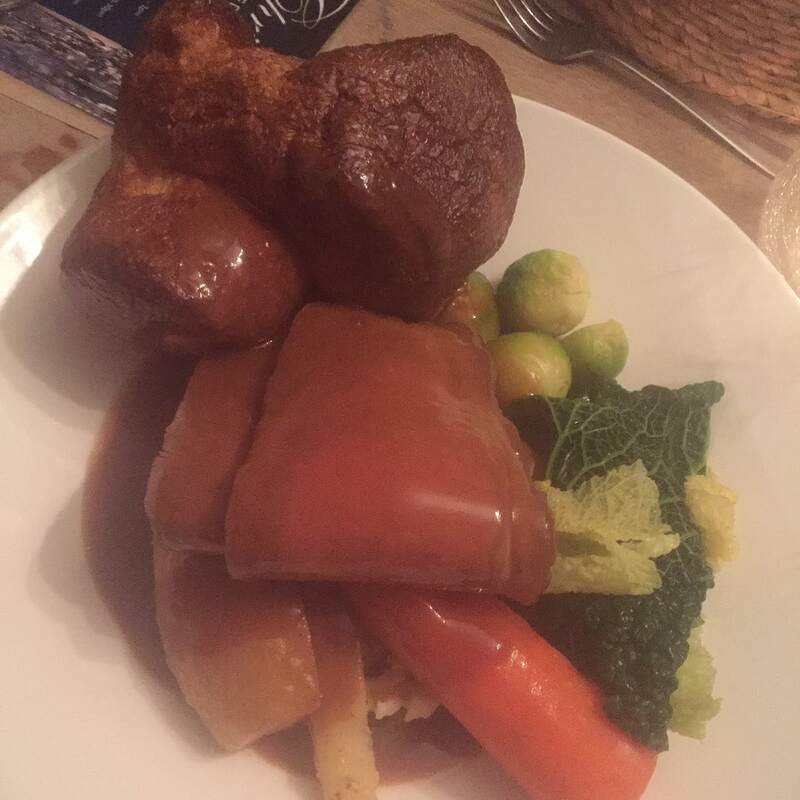 Beef Roast dinner with Yorkshire Pudding at the Dabbling Duck. So good! Bread sauce is a milk-based creamy sauce that can be served warm or cold and is thickened with breadcrumbs. We had some bread sauce with our turkey for Christmas Dinner. Bread sauce can be traced all the way back to medieval times when cooks used bread to thicken sauces. The idea to use bread this way probably comes from cooks wanting to use up stale bread and discovering the breadcrumbs could be added to sauces to make them thicker. 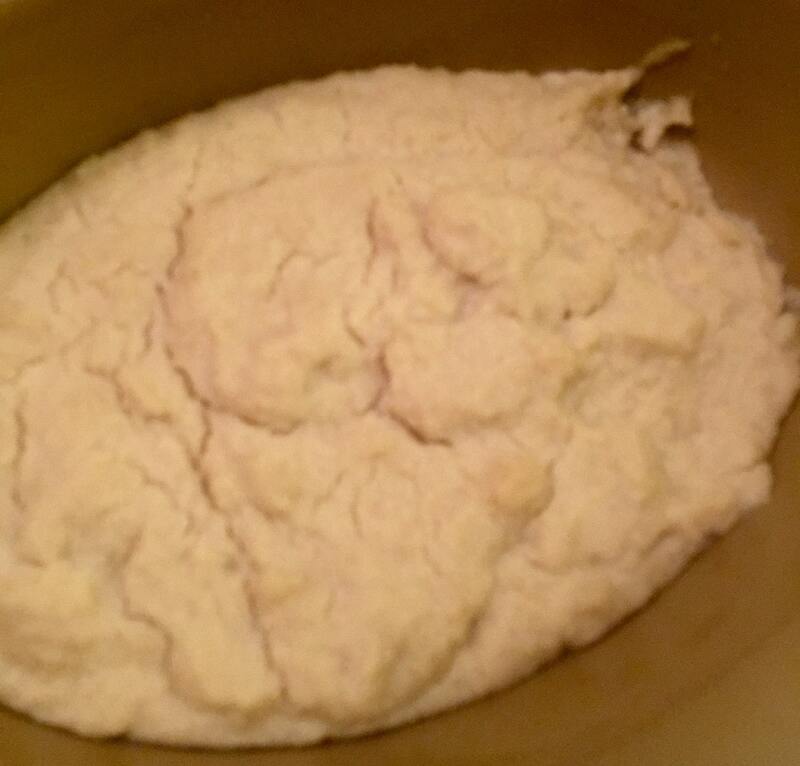 Bread Sauce tastes much better than it looks! These British Christmas desserts are similar but not the same as the fruitcakes you would get here in the US. The cake is baked weeks in advance and then “fed” a little bit of brandy each week. Then there is a layer of marzipan and it can be decorated, usually white frosting and then a Christmas theme. The cake can have anywhere from a ¼ to ½ bottle of brandy in it. The alcohol does not get cooked off, so perfect for a party dessert. The pudding doesn’t get decorated and you can also buy it on Amazon. Instead, a little bit of warmed brandy is poured on top and then it is set on fire (be careful, it will flame up). You serve it with a custard sauce which is sort of like a creamy vanilla sauce. 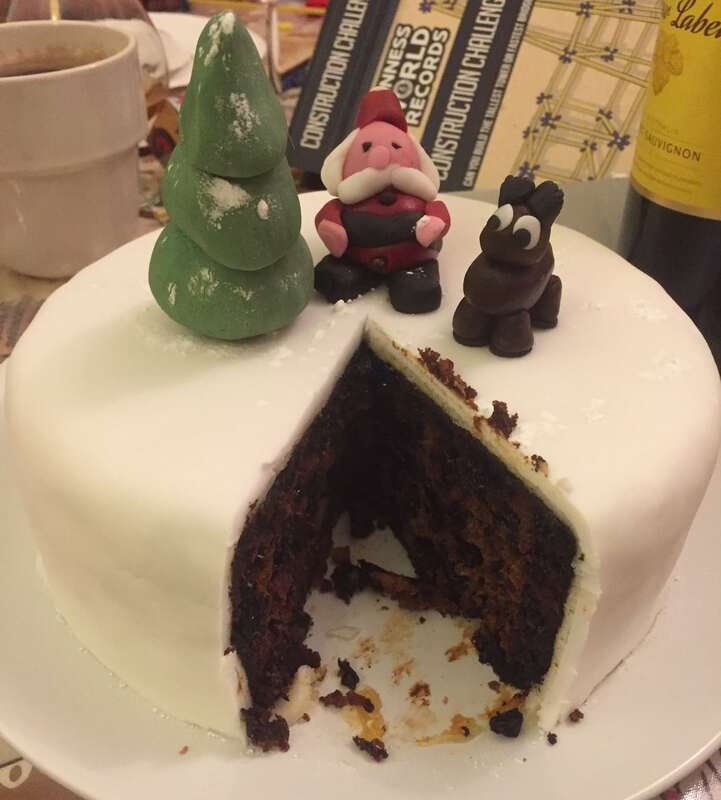 Russell’s first attempt making a Christmas Cake and it was delicious. So yes there is more to traditional British food than fish & chips or curry. I really was pleasantly surprised by how much I love British food. Do you have any favorite British foods that didn’t make my list? Keep an open mind and try some of my favorite British foods, but stay away from mushy peas! 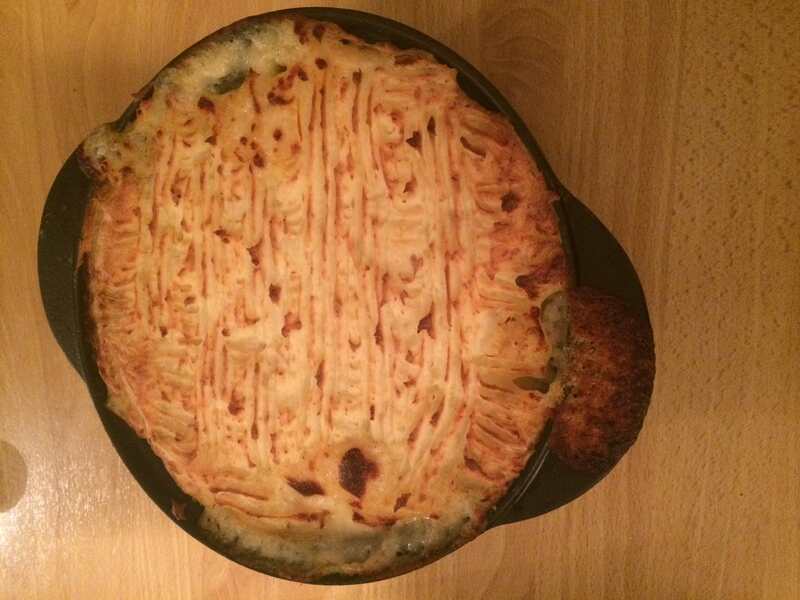 Here is a recipe if you would like to make fish pie at home. You can also try making a Christmas cake using this recipe. Luckily, you can buy British food online even if it is not available in stores in the US. Click here to see what is available on Amazon. Yes to all of them – specially Yorkshire Puddings, a Sunday roast is not complete without them!!! I hope you stocked up on proper Cadburys chocolate whilst you were here? Real chocolate not Hershey rip off stuff! Oh and pork pie and sausage rolls (I believe they originated in England) – do you have them in America? have you tried them? Perfect with brown sauce (HP). Oh yes, cadburys is much better from England. I have not tried pork pie so will put that on the list for my next trip. I did try game pie, which I debated adding to this list but decided to try to keep it short. I haven’t had sausage rolls either while in England although I think that is similar to what we call pigs in a blanket except we use a pancake instead of puff pastry. I did try English pigs in a blanket and those are good! And agree why does everything that tastes so good have to have so many calories! Maybe it was the version of mushy peas I tried, although I did try two. Do you have a good recipe for mushy peas? Haha. Yes the ones I tried came from a tin. I thought that might have been the problem. A good Melton Mowbray Pork Pie is a must! Cornish pasties as well. I’ve not given Anisa either of those yet. I’d take some across to New York with me, but you can’t take meat products through customs. I used to go to the Half Moon pub in Skidby when I lived in Hull (that’s near you I think). They served the most amazing yorkshire puddings that were light, fluffy and the size of two house bricks on top of each other, filled with roast beef and gravy. Delicious! I’ve not been for years, so I don’t know if they still do it. Tim – haha! I have not tried marmite yet. My boyfriend loves it. I am a little scared to try it after my experience with vegemite. Oh Tim – that comment started so well! No Marmite!!! Don’t listen to him Anisa. Marmite is great – particularly on toast. I have never heard of bread sauce before. I’m not sure it looks that appetizing, but I’d certainly be willing to try it! Corinne – I hadn’t heard of it either. And I agree it doesn’t look that appetizing but everyone else seemed to really like it, so I tried it and it was pretty good. You should try it if you get the chance. Oh no! I have not tried any of this food. I went once to London but the visit was brief and we ate international food (which is supposed to be good in London). I would like to try this (the sweets first!). Ruth – It’s understandable, I’ve learned about these foods from my British boyfriend. Most tourist probably have not tried these. Just another reason for you to go back! Tanja – Understandable, its not for everyone. When you say breakfast bacon do you mean the stuff that is similar to what we call Canadian bacon? Or something else? Yes, yes, YES to clotted cream! Like you I can happily eat all of it with a spoon. People in America don’t know what they’re missing. You hit the nail on the head on five of the six, and I’ll add Ribena blackcurrant syrup (blackcurrant anything!) and Cadbury flake bars. The one I’ll disagree with is black pudding. I’ve tried it and think it’s disgusting. The texture of congealed blood was so awful I had to spit it out before I gagged. Yuck. I’ll take mushy peas over black pudding any day of the week, lol. Thanks for sharing this great post on #TheWeeklyPostcard. Thanks Linda. I did have blackcurrent syrup in Ireland and it is delicious! And yes I love all the different Cadbury chocolate candies. So yes I agree we could use more of both of those. As far as black pudding goes, I was surprised I like it but definitely understand it might not be everyone’s cup of tea. I think it depends on which black pudding you have. Good quality black pudding, cooked well is delicious, served with a poached or fried egg. Poor quality black pudding is terrible. My recommendation – never ever buy cheap black pudding! Oh and mushy peas are just wrong. This really made me giggle! I’m sure there are a few American specialities that we Brits could also do with. I hope you managed to try a Melton Mowbray pork pie with piccalilli too, always a winner. Fern – so glad this made you laugh. I might have to right another post about American food for Brits. I will have to try the Melton Mowbray pork pie on my next trip. Thanks for the tip. It’s funny reading articles about English food. In my experience (in the South East England) we hardly eat any fish and chips unless we have that as a treat when we go to the seaside. But we do (or at least my family do) eat a fair amount of curry at least once a month perhaps. Here’s some more classic British things you should try. Beef stew and dumplings (dumplings have to be made with suet), shepherds (or cottage) pie, and last but not least a good quality full English breakfast with tinned tomatoes and baked beans. Lastly but by no means most Brits could practically survive on cups of good quality tea with nice biscuits to dunk in it. Thanks for all the suggestions! I love shepherds pie, we do have that here as well. I need to try the beef stew and dumplings. Chicken and dumplings was one of my favorite dishes growing up but its hard to find it here (I live in NYC now). I love tea and do drink my fair share (I’m not a coffee person). I have had a full breakfast with beans (sorry not a fan of the beans) but I will have to try the tinned tomatoes. I might have to write a follow up blog post on these! P.S Oh and if you do have fish and chips at the sea side ask for onion vinegar & get a pickled egg to go with it. Yum. I love fish and chips by the seaside! I went to Aldeburgh (one of my early blog posts), they have the best fish and chips. I always have vinegar but I think it is just malt vinegar? So I will have to ask about onion vinegar and the pickled egg next time. Thanks again for all the suggestions! Indrani – Try the black pudding, I was really surprised how much I liked it. And yes, love fish pie!